Turtles are funny, especially the way they move their head in and out of their shells. 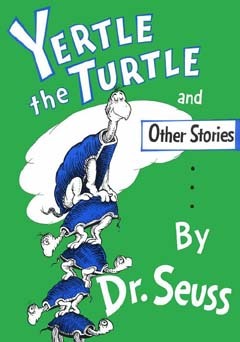 Growing up, I liked the Dr. Seuss book "Yertle the Turtle" and still think Yertle is an awesomely funny name. If I ever get a turtle, I'm definitely naming it Yertle. Turtles are reptiles of the order Testudines (the crown group of the superorder Chelonia), characterised by a special bony or cartilaginous shell developed from their ribs that acts as a shield. "Turtle" may either refer to the Testudines as a whole, or to particular Testudines which make up a form taxon that is not monophyletic—see also sea turtle, terrapin, tortoise, and the discussion below. Like other reptiles, turtles are ectotherms—varying their internal temperature according to the ambient environment, commonly called cold-blooded. Like other amniotes (reptiles, dinosaurs, birds, and mammals), they breathe air and do not lay eggs underwater, although many species live in or around water. The largest turtles are aquatic.